Sift flour and salt into mixing bowl. Break the eggs into a well in the centre. Start to whisk the eggs, gradually adding the milk (or use a blender). Add spinach and whisk until incorporated. Just before cooking stir in melted butter. Cook the pancakes in the usual way. Serve scattered with grated cheese or fill with tuna in white sauce. 1 bunch of spring greens, tough stalks removed and leaves shredded. Mix all the dressing ingredients together in a bowl and season with salt and pepper. Add the juice of 1 lemon to start with, taste and add more as you prefer. Cook the greens in a pan of boiling water for about 3 mins, until just tender. Drain and toss them in just enough of the dressing to coat, and then serve straight away. If there is any dressing left over, it can be stored for a while in a screw-topped jar in the fridge. ALFI’s annual “Seedy Saturday” is next Saturday (4th February, 10am-12pm, Alton Methodist Hall). Please bring your seeds to swap; if you have none to share, you can still participate and collect seeds for a small donation to ALFI. Tea, coffee, biscuits and advice will be available. “Seedy Saturday” is with us again, and so I’ve been busy reviewing my saved and purchased seeds, and sorting out which to share, which to keep, and which need to go to the “big stale seed-bed in the sky” [see our seed-saving guide]. Looking through my records (actually, just the hand-written labels on the little plastic bags I’ve re-used for many years), I’ve been saving seeds since at least 2007, probably a little longer, starting only a couple of years after taking on my first garden. One of the first things I remember saving on a regular basis was French marigolds (Tagetes), picking the faded heads and drying them indoors, before pulling the weird little match-stick like seeds from their papery casing, and putting them away for the next season. Over the years it was fascinating to see them gradually change from their original bright yellow to a mix of orange and deep red, presumably reverting to an earlier, more natural form. I saved the seeds like this for several years, somewhat uselessly naming each packet after their parent plant things like “mostly red, with orange” or “red with lots of orange”, despite the fact that their progeny could be coloured pretty much as they chose! But then one year, perhaps due to the weather, or maybe daunted by the prospect of the many nights of torchlit slug-hunting it would take to keep them safe, I missed sowing them, and my little packets of seed sat forlorn. When I returned to them in a subsequent season, no plants emerged: their fragile life had faded. It turns out that Tagetes seeds only really last a year, and that their increasingly unique DNA, surviving for so many years in my seeds, was only one careless (or busy) gardener away from dying out for ever. French marigolds are ten-a-penny, and my failure to save mine is no great loss to the gene pool, but there are many varieties of edible and non-edible plants that are much more special, and have survived only by being handed down in an unbroken line from gardener to gardener for many, many seasons, in pretty much the same way that humans have selected and persisted crops for thousands of years. These ‘heirloom’ varieties might not attract the commercial grower, being perhaps too difficult to harvest with a machine, or having too short a “shelf life” once picked, but they have been preserved by gardeners because they have something special: perhaps they crop a little earlier, or later; tolerate a sticky local soil or tricky climatic conditions; have a uniquely coloured flower or fruit shape; taste that little bit different, or just because they are a sentimental, yet tangible link to the past. While few of us in this country lack the money necessary to buy seeds (though there are sadly those who do), and we’re always tempted by the offer of new varieties from the seed producers, with their reassuring silver-lined packets, bright photographs and bizarrely accurate instructions (“sow 7mm deep”!) , there’s also something quite satisfying about collecting those little capsules of life yourself, and popping them safely away in labelled packets through winter, to be rediscovered, remembered, and tended back to life come spring. Sharing with your friends (and strangers) not only enhances the enjoyment, but also adds a bit of insurance, a little bit of protection, from bad weather, and bad gardeners! Come along to our “Seedy Saturday” on Saturday 4th February, 10am-12pm at the Alton Methodist Hall, and bring your swaps. Don’t worry if you have nothing to swap yourself, you can still pick something up in exchange for a small donation to ALFI. As well as locally saved seeds, we’ll also have some commercial offerings that we will divide up and share, making better use of our resources. Remember also that our “Seedling Swap” is in early May, so if you end up growing too many, or too few, you can also swap there. Our Seedy Saturday (seed swap) in February was a great success, with a great many seeds on offer, and our subsequent Seedling Swap in May went well too, although the cold start to the Spring nobbled our most tender plants and we were practically bean and squash-less, with the notable exception of Runner Beans! The plot at the Vicarage received a number of new fruit bushes and trees, and produced a flush of wonderful fruit, so much in fact, our pickers could hardly keep up with it. Other plots continued to be wonderful, with the Station Plot getting a new growing barrel and a bird table, and sporting a very unusual container in the form of an old Spanish guitar; the Westbrook plot absorbed a great deal of hard-work fighting invasive tree roots, before hopefully finding a solution which will vastly improve its yield, and our little orchard at Jubilee Fields produced its very first apples. We got some great new ALFI signs for all the plots and planters, and a Alton Men’s Shed made us a couple of fantastic notice boards. O ur planters got shifted around quite a bit due to the council’s new flower arrangements, and ongoing works around the Station, with our rings and hops opposite The Railway pub sadly loosing out to a storage area, but some new ground was gained next to the refurbished building next to the Taxi office, and we gained a brand new planter outside the library. Also shifted around a bit was the committee, with long-serving members taking a bit of a breather, or swapping roles, and long-lost members returning to the fold. Our annual schools competition was another winner, with some super drawings we’ve put on display at the Station Plot, celebrating our theme of “Greening the Grey”; we really loved the work that was put into these. Rounding up the season, our annual Harvest Feast in October was so incredibly popular, we ran out of room, nearly ran out of soup, and chided ourselves for not baking more cakes! Last, but not least, our entry for the Christmas Tree Festival at St. Lawrence was literally the hottest thing there, decorated as it was with chilli peppers! Thanks to all our plot-keepers and other volunteers, to everyone who’s supported us or contributed to funds, and to the people who’ve passed on their admiration and thanks for our work: there’s really nothing better than a compliment delivered in person. Cheers! Have a great year! 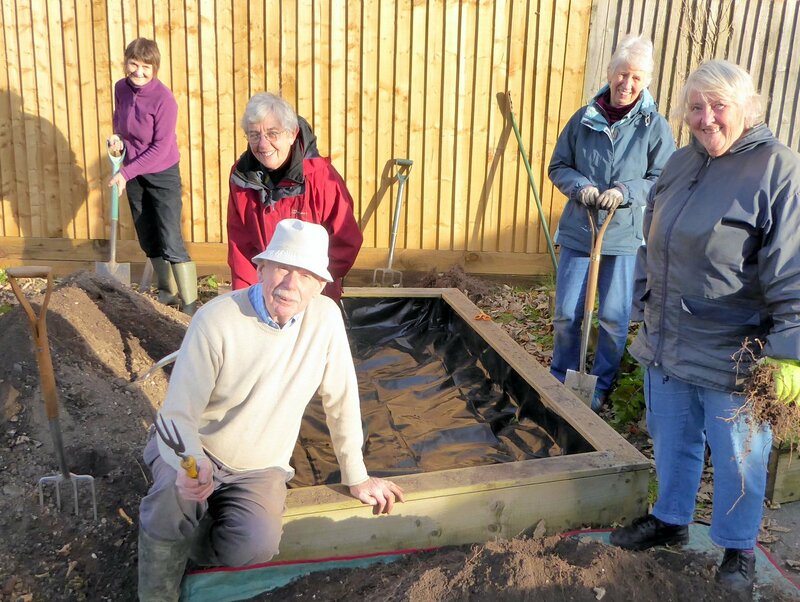 The Westbrooke plot volunteers have been busy digging matted fibrous roots out of the small raised bed – they have grown through the fine porous membrane at the bottom of the bed from a nearby sycamore tree – and removed most of the impoverished soil. The bed now has an impermeable strong membrane to deter the roots, and been refilled with a mixture of new top soil, soil improver and some very well rotted horse manure. By the spring we hope to have a very fertile mix ready for planting for the new season. May has turned chilly and wet, so today I’ve been looking for excuses not to do all the gardening I need to do, hence this article! One of the things that does love cool weather is lettuce: it won’t even germinate above 21°C (70F), so it’s best to start it off whilst it’s still cool. When I first started gardening, I tried growing lettuce in the ground, in traditional neat rows like I saw in books. It was a bit of a disaster: all the green leaves (Cos) got eaten by slugs, whilst the slugs avoided the red leaves (Batavia), but then so did we, since they were really quite bitter! Subsequently, I’ve discovered the secret to growing enough lettuce to keep you in interesting leaves all year is to plant a mix of varieties in containers. Planting in containers means you can put them out of the reach of slugs, perhaps applying a bit of copper tape to the sides, or placing on a window-sill, door-step, or just paying them more attention and picking off slugs and snails at night, to avoid too much damage. You can also move containers around the garden with the season, seeking the shade during hot periods, and you can also efficiently water and harvest them. If you haven’t got much outside space, then of course, containers are your go-to solution. For your container, you want something that’s going to be big enough to supply you with enough leaves to make it worth while, and to not dry out too easily: the sort of ‘live lettuce’ trays you buy in a supermarket is about a tenth of the surface area and a quarter of the depth you want! I usually grow in a trough about 30cm wide and deep, and 60cm long. You can, of course, grow in containers less deep, such as seed trays or re-used trays from packaging, but be aware that you will need to water much more often, as salad leaves soon go to seed and stop growing nice leaves if they are stressed by drying out. Equally, ensure that your container has sufficient drain-holes in the bottom, since otherwise the roots will rot if the British summer delivers its normal quantity of rain, or you accidentally over-water. Sowing a mix of varieties, as a ‘cut and come again’ crop means that you never get bored of a single variety, and gives a chance to try out some interesting leaves, without ending up with a crop nobody wants to eat. Retailers sell traditional ready-mixed ‘salad bowl’ leaves, and themed mixes such as Italian (usually with Salad Rocket) or Oriental (usually with Pak Choi and Mizuna), or you can buy a couple of varieties you know you like, and mix them yourself. Be aware that some varieties are more vigorous than others, and this will affect the productivity of the less vigorous varieties: for instance, I’ve found it’s best to grow Mizuna (Brassica rapa var. nipposinica) on it’s own, since it will out-compete anything else (it also crops longer than anything else, and resists slugs, though is a bit too coarse on its own). For sowing, choose a good, reasonably fine compost (I prefer a peat-free composts), fill your container to about an inch off the top, and gently firm the surface before watering with a fine spray. Scatter your seeds reasonably densely: you are looking for something like two or three seeds per square inch; then cover with just enough compost that you can’t see any seeds – don’t bury them too deep. For best germination, put the container outside, in a shaded spot, and make sure it never dries out, without making it soggy. You should see germination in about a week. Once the seedlings have grown several leaves each, and are starting to jostle for space, you can start harvesting. To maximise your crop, try not to damage the centre ‘growing tip’ of the plant – the bit where the baby leaves grow from, as the plant will stop growing without it. Cut individual leaves, or carefully trim a block with scissors if you’re in a hurry. Aim to thin-out the leaves and allow more to grow in their place. With careful harvesting, and regular watering, you should be able to have fresh leaves for up to three weeks. Once the plants start getting weak, or if they start flowering, it’s time to move on: for a continual supply, try sowing another container about three weeks after the first. Now that’s what I call a salad! If the plants do start flowering, remember that you can eat the buds, flowers, or indeed the whole plant, so make the most of it! You should be able to sow lettuce all through Spring and into Summer, and then again once mid-summer has passed. Lettuce is one of the earliest, and the latest, crops you can grow, and you can even over-winter some the oriental ones in a cold-frame, unheated green house or conservatory.